It’s got dings and dents. It’s been rolled. It’s neither the first nor the last of its breed, has no particularly special equipment, and is one of thousands like it to roll off an assembly line. But the Historic Vehicle Association saw fit to choose President Ronald Reagan’s 1962 Jeep CJ-6 – even over the pristine CJ-8 that the president also owned – as one of a pair of presidential vehicles to go on the National Register of Historic Vehicles. In his lifetime, Reagan owned two California ranches. The first, Malibu Creek Ranch in the Santa Monica Mountains, he bought in 1951. To tend it, he eventually bought the extended-wheelbase CJ-6 (serial number 21156), originally painted green and fitted with the 134-cu.in. F-head four-cylinder, T90 three-speed manual, Spicer Model 18 transfer case, Dana 25/44 front/rear axles, and factory optional Ramsey 8,000-pound PTO winch. 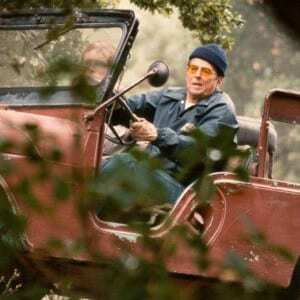 Though he sold the ranch in 1966, he kept the Jeep and moved it to his second ranch, the 688-acre Rancho del Cielo in the Santa Ynez mountains. Photos by Casey Maxon, courtesy Historic Vehicle Association. The purchase of the second ranch, in 1974, came during a time of transition for Reagan. He was on his way out as governor, and to mark his time in office, members of the California National Guard repainted the CJ-6 for him in red with white pinstripes. However, according to Fisher, patches of green paint remain visible and the California National Guard left the original green seats as well as the various dents Reagan had inflicted on the Jeep. “This Jeep is for work,” Reagan responded. The Jeep remained with Reagan through his presidency, though as his health declined in the mid-1990s, Nancy Reagan decided to sell the ranch intact (“down to the toothpaste, china, and furniture,” Fisher said), minus the three vehicles on the ranch: the CJ-6, the CJ-8, and a 1978 Subaru Brat, all of which she gave away to friends. The organization to which Nancy Reagan sold the ranch,Young America’s Foundation, eventually tracked down and repurchased all three, though it didn’t have to go far for the CJ-6: Nancy Reagan had gifted it to Courtney Trisler, the ranch’s manager, and the Jeep had remained on the ranch the entire time. According to Fisher, the CJ-6 remains in the exact condition the Reagans left it, though the foundation has drained its fluids and kept it in dry storage to preserve it. The Jeep’s journey to Washington, D.C., will take place as part of the HVA’s second Cars at the Capital event, which Gessler noted will take on a different format than its predecessor. Instead of featuring several cars in a tent on the National Mall over a weekend, the second Cars at the Capital will include just two vehicles: the Reagan CJ-6 and the 1909 White Model M 40-hp steamer that William Howard Taft ordered and that comprised one-third of the first presidential automobile fleet. According to the White House’s description of the White steamer, it was Taft who introduced automobiles to the presidency and scrapped the tradition of using horse-drawn vehicles. From his initial $12,000 budget for the presidential fleet, he converted the White House stables to a garage, hired chauffeurs, and bought the White (serial number 6765) and a pair of Pierce-Arrows. Sunday drives in the White also apparently led to the creation of Washington, D.C.’s, Potomac Drive and the planting of D.C.’s famous cherry trees. The Taft administration disposed of the White at a government auction in 1911, and it eventually ended up in the hands of Rhode Island collector George Waterman, who in the fall of 1969 sold the unrestored steamer to Josiah Lilly III, who then had Cleveland-based restorers Bud Ley and Sons restore it for the spring 1970 seasonal opening of his museum. It has remained in Lilly’s museumever since. The HVA will display the White and the CJ-6 consecutively in a glass case between the National Air and Space Museum and the National Gallery of Art on the Mall. The White will go on display from April 14 to 19, while the CJ-6 will go on display from April 20 to 26. Both vehicles will also go on the National Historic Vehicle Register; the Jeep will become the second National Register-recognized Jeep after the Ford Pygmy prototype, which went on the register last December. For more information about the Historic Vehicle Association and the National Historic Vehicle Register, visit HistoricVehicle.org.